(b) Have a Negative PT test (9-2 Form) less than 90 days prior to the show date and have a permanent leg or wing band. 1. (a) Either be NPIP and have a Form 9-3 less than 30 days prior to the show. (b) Have a negative PT test with Form 9-2 less than 90 days prior to show and have a permanent leg or wing band, a Veterinarian Health Certificate less than 30 days prior to the show date. 1. 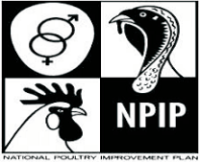 All Eggs being shown and sale birds must be from an NPIP Flock. You must Submit NPIP forms to the Show Secretary with your entry. New Requirements have been approved by the State Department. Attached is a new Avian Exhibition Permit that should be used for all Poultry Exhibitions beginning January 1, 2019. Please use the new form and guidelines outlined within for all future poultry exhibitions. Anytime Poultry crosses the state line, there must be documentation of movement. This is for your protection as well as other poultry producers in the case of a disease outbreak. It is also a USDA ADT (Animal Disease Traceability) requirement. NPIP flock owners have an advantage and are able to by-pass having to make a special trip to a veterinarian for a health certificate. You are able to complete, on your own, an NPIP 9-3 Form documenting the movement of poultry out of our state. While this is not required for in-state movement, it is recommended. Several flock owners do it because it’s just easier to keep track of their sales for their own benefit as well. If you do not complete a 9-3 form for in-state movement, you are required to keep records of any poultry that you sell. That could be as easy as having a notebook with a running list of buyer’s names and addresses.